Ex-president Robert Mugabe's law enforcers also suddenly remembered that Kuruneri was holding a Canadian passport alongside his Zimbabwean one. That became a handy offence to nail him with too. The law didn't allow dual citizenship and the fact that he was a top government official didn't help his cause. It was quite close to treason to be a citizen of a country that had imposed sanctions on Zimbabwe. Kuruneri subsequently spent a year in remand prison and was only acquitted after a High Court ruling. Now, the current Energy minister, Jorum Gumbo, looks like he is following too many adverts on cholera and has forgotten all about Kuruneri in the process. Last week, ominously like the ex-Finance minister, he was quoted by the Herald as he also mumbled some mumbo jumbo about his hands being clean. As if he had been invited to a grand banquet that he couldn't miss. People are always all too happy to see citizens with clean hands. More so when they arouse our attention by stepping at the instance to disturb our morning sleep with their talk. Irritatingly though, all Gumbo did was to display his heavily mucked palms instead. Thanks to the interview, the world got to know fresh things about the minister's dirty past in the Transport portfolio. It was pleasantly shocking to discover through the Herald story that Gumbo's company, JMCD, had been gifted a tender to supply clothing material to Zinara, a state enterprise that fell under his portfolio when he was Transport minister. Weirdly, Gumbo doesn't think there is conflict of interest in that. For him, JMCD won the tender purely on the basis of its competitiveness. More weirdly, he tried to wiggle out of the mess by arguing that Zinara wasn't the only government entity he was doing business with. And since he was also supplying the army, the Health ministry and a host of other government departments, people must shut up about his involvement with Zinara because it's just one other public entity, so he argued. But that is pathetic reasoning, especially coming from someone who claims to hold a doctoral degree. A department that falls under your ministry is not just one of those departments. You are the boss and your subordinates are normally beholden to you. They want to keep their skins unharmed. They also hope to gain your favour by doing you a favour. They will do everything to pay the protection fee, particularly in the case of the former Zinara management that you wouldn't want to think of as saints, given all the dirty work it was doing over the years. And, as the minister, you know very well that you wield so much power over them. The cloth is cut out for you right from the start and it's easy to manipulate the subordinates for personal gain. Add to that the fact that the then State Procurement Board, another dirty outfit by all measure, could easily crumble under Gumbo's influence. What nonsense is it when Gumbo tries to justify his business involvement with Zinara on the basis that he is also doing the same thing with other government departments? You don't try to wash off your sin by telling us that you are committing it in other places too! Have you ever heard of a murderer who steps up to tell the judge that he is not guilty of killing because he has killed in other instances? That would be the stupidest thing this world has ever heard since Bill Clinton said he didn't take weed because he only puffed at the stub and didn't inhale the smoke. The point is, Gumbo is also guilty of conflict of interest by doing business with the other government departments for as long as he holds a senior government position. It doesn't matter whether he is doing that with the army or Health ministry. Procurement officers in those departments are bound to either get too scared not to give him the tenders or see a fat opportunity to get close to the minister for their own benefit. Gumbo's influence now and then must never be underestimated. He was close to both Mugabe and Emmerson Mnangagwa, the current president who has held influential positions in government since independence in 1980. Gumbo is related to Mugabe on the maternal side and it is common cause that the ex-president held him as a blue-eyed boy if not useful errand boy. On the other hand, he and Mnangagwa are homeboys from the Midlands province and shared a lot of notes when the new president was climbing up the ladder. Thus, as a double dipper, Gumbo found himself in an enviably powerful and strategic position. The Zinara scam doesn't end there. Through the Herald story, we also got to learn that Gumbo was drawing money from the roads authority at the drop of a hat. If he wanted to go down to the Midlands "on ministry business", he would take money from Zinara. When he travelled outside the country to negotiate the illegal deal involving ZimAirways, a shady airline that has all but folded, he took money from Zinara. To show that his hands are clean on this, he gave us the most unbelievable reasons. For him, Zinara is the cash cow that must be milked whenever anything with the word "roads" in it is involved. That came out straight from his mouth. Surely, this is against fiscal prudence. And there is nothing in all the laws of the country to empower a minister to draw money from public entities in such a manner. It's not only unprocedural; it's criminal. Last week's Herald revelations of Gumbo's dirty tricks could have taken a lot of people aback. But, frankly, there is nothing new here. 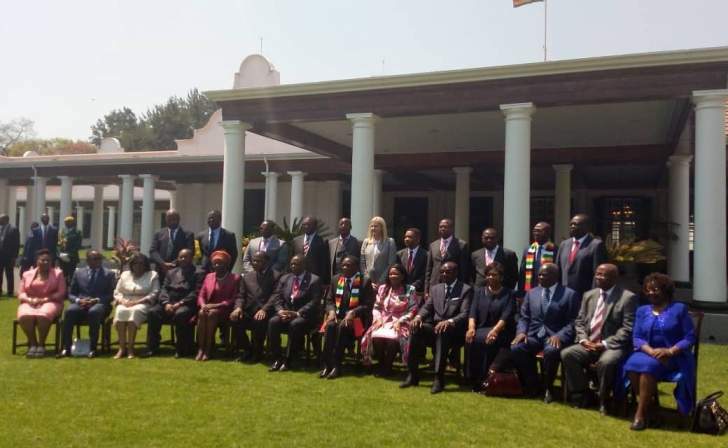 Against all advice, Mnangagwa retained Gumbo in his post-election cabinet. Here is a guy who failed to take action against the Zinara board and management for repeatedly flouting tender regulations, dishing out institutional funds to Mugabe's wife, Grace and stealing company money. This was despite the fact that Gumbo actually admitted that a lot of things had gone bad at Zinara, when Mugabe made him minister in 2015. The ZimAirways scandal is probably the biggest blight on Gumbo's political CV. This airline, so we learnt, was registered in 2012. Nicholas Goche and, subsequently, Obert Mpofu left it like that when they ran the Transport ministry. And Gumbo retrieved it from the archives when he took over the portfolio and did a lot of wrong things with it. He lied about its board. One of the purported members, Anne Mutswiri, said she was never consulted and didn't know that she had been appointed to the board, for instance. Gumbo presided over a rotten purchase deal, using more than $70 million from state coffers to buy two decommissioned planes that have since been returned to Malaysia. And he was lying through his teeth as he did this. First, he claimed that the airline was set up by a Zimbabwean Diaspora-based consortium. He changed the story last year to claim that it was a government entity but didn't tell us what it was doing when there was Air Zimbabwe to worry with. Fine, he claimed that it would eventually replace Air Zimbabwe as a way to avoid the seizure of the national airline over a debt, but forgot to explain how a new government outfit would avoid being seized too. Gumbo imposed himself as a consultant in the Zim Airways deal. A bizarre thing for a Cabinet minister to do. But maybe it's because he knew that it would give him the leeway to impose his brother's daughter, Mavis, as the landlord of the airline as was the case, and do all manner of other dodgy things. He lied that Mavis had landed the landlordship through a local estate agent. The alleged agent, Letbill Realty, denied this. In a way, it is encouraging that Gumbo was recently exposed through the government-controlled media. There is hope that it could be a precursor to the minister's arrest and expulsion from government. But Mnangagwa is not exactly famous for taking such action against corrupt ministers, so it's fifty-fifty at the moment. The president is yet to utter a word on his Health minister, Obadiah Moyo, who faked his skills and experience, and it is business as usual with Gumbo.